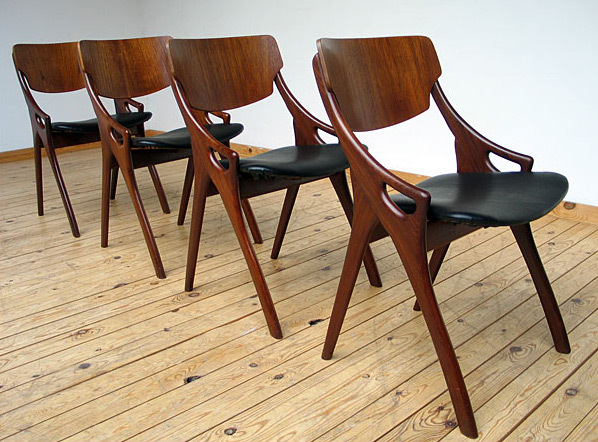 4 Dinning chairs designed by Hovmand Olsen constructed form solid teak wood. Plywood back rest and seating, seating upholstered with black vinyl. Organic shaped side handles for easy comfort. Would adapt in a modern Denmark Scandinavian interior. 4 chaises de salle a manger conçu par Hovmand Olsen. Construction solide en bois teck. Support dos et assise en bois plywood, tapisserie d'ameublement sur les assises en vinyle noir. Poignées forme organique pour le confort. S'adapterait dans un intérieur Wegner eames 1950.